I started writing this column a little over five years ago and while the monthly deadline seems to come up quite quickly, you cannot replace the people and stories that I have had the opportunity to know along the way. I have never had to wonder what to write because someone or something horsey is always in front of me to let you know about. I have also realized that not only people with horses read this column, but those who just love horses or enjoy reading about local people and events. Every year or so I start getting asked a lot of similar questions about this column or what kinds of activities or resources are available for horse people in our area, which lets me know it is time to do a “station identification” or who we are article. Please know that I am a phone call or email away if you have ideas for articles, a new horse business, an event to post or just a question. Reach me at 303-638-0994 or [email protected] All shapes and sizes of horses and saddles welcome! 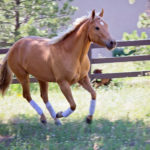 The articles and the website are meant to connect and serve our local horse community, but the ultimate goal is to celebrate the horse for the amazing and magical animals that they are and to share how they have touched and changed lives for the better. They have chosen to share themselves with us and teach us insightful lessons. We don’t always treat them as we should or give them the respect they deserve, but they continue to bless us when in their presence. 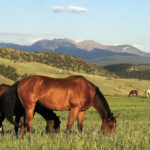 The events you find in this article are there to give you local activities to do with your horse(s) while meeting new people, exploring our area, bonding with your horse and maybe even learning some new skills. The articles that you find here are often about local people and how horses have changed their lives or those that they work with. Articles may cover a local horse event, something incredible a local person is doing with horses or how horses are part of a local business. Ideas are always welcome and we keep the articles to those that are connected to the Colorado Serenity Magazine readership area. You can find past articles on the website Blog. Several trail rides are planned during the spring, summer and fall. They vary by what days they are on, but are often during the week so that the trails are not as busy. The trail rides are loosely organized and similar to just meeting some friends for a ride. We usually do not have a very big group, 3-6, and ride to the level of the least experienced rider or horse. 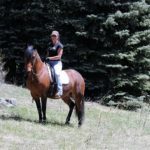 We pick a new trail every time so it is a great way to explore new trails and meet new horse people. Trails that we have explored this year include Centennial Cone Open Space, Staunton State Park, Mount Falcon Park and Alderfer Three Sisters. There are slide shows on different trail rides under the “Trail Guide” tab on the website if you are wondering what a trail might be like. Let me know if you would like to be on the trail riding email list. Every year the Colorado Corral puts on what we call the Ranch Race at the Evergreen Rodeo Grounds. Basically it is a fun ranch-style trail course that always includes cows. Horsemanship is the focus, but we time you just to keep things moving! This year the clinic is on Saturday September 13th and the Competition is on Sunday September 14th. You can do one day or the other or both. This is also a great local event to meet people, have some fun and maybe learn some new “tricks”. The clinic will teach you all of the obstacles for the following day. There are more specifics under the dates at the “Events” tab. Last year Western Dressage was added to the weekend. We have an instructor that has trained as a clinician with the Western Dressage Association and on Sunday we include a Ride-A-Test style schooling show in a small arena with a USDF judge. Of course anyone is welcome to do the Ride-A-Test, English or Western. Gaited horses welcome too! We have the weekend organized so that you can participate in both the Ranch Race and Western Dressage if you wish. The proceeds of the weekend are donated to a local horse non-profit. Volunteers needed! The website is your 24/7 outlet for our horse community. Under the tabs you will find the Trail Guide, Horse Businesses, Blog (past articles and more), a local Events calendar and resources for buying and selling horse properties. If you want to be added as a business or put an event on the calendar just let me know, it is FREE!